Getting ready to go on a trip. Everything there? As a veteran dive/travel adventurer I have "met the enemy" of non-organization and it is I… I've learned (not always the hard way thank goodness) to "make a list, check it twice" re what to take on various types of outings. In an attempt to either save you the same sorts of inconveniences, or bolster your similar planning plots, here are my general and specialized lists (and notes) of what I take when away. General: These are the items I pack for every trip. Itinerary Additionally, do add the phone numbers of hotels, contacts, embassies… in your travel documents. Passport, Visa/s, WHO Documents… and copies in luggage and home. Permits… to collect, transport, import… If this is part of the trip. Better are contacts, friends/associates in the field who will hold, ship such items at a later date. Address Book: Do you like getting "letters/postcards from far away?" Me too. You can use a small, "traveling" addy book to record the names, whereabouts of new friends met on the road as well. One of my fave activities while stuck in transit is to fill out, send foreign posts. Try this and you'll be hooked. Credit Card: I take two, no more. Dive ("C") Card (and copy on paper), even if you're not sure of diving. Frequent Flyer Mile Program Numbers or actual card. Don't miss the opportunities these programs afford. I religiously use frequent flyer credit cards for any large (tens of dollars) purchases. The upgrades, free trips, access to airport lounges and more are well-worth the bother. Throw Away Wallet. In addition to not bringing any extra cards for grocery shopping, using phone companies that don't exist where I'm going etc., I bring a wallet to carry just what I need when going out on the town (so to speak). "Things happen"… you might be robbed, drop your valuables… only take what you want in this "spare" wallet, leaving other material in the room safe, locked in your luggage, with the front desk. Toiletries et al. I use one or more of the zippable clear (for customs and my utility) plastic, soft/crushable carrying bags, with messy materials sub-packed in closeable clear bags in turn (see below). I take these important items as "carry-on"
Soap & Shampoo. Do bring your own… there may not be any otherwise, or makes, models you don't care for. Try a dry soap that can/will do as all… wrap in a small plastic zip bag. Washcloth: Don't forget this… a real joy where water is scarce, not quite the right temperature. Deodorant: Roll-on type, travel size. Razor: Plastic, new with cover. Toothbrush & Paste. Collapsible for the former, small for the latter. "Medicines": I carry a few of these with me… if anything prescription, bring the prescription (and a copy) with you. If practical, leave real medicines in their own container, blister packing. Analgesics: I pack simple salicylates (aspirin) as well as Advil, mainly for muscle aches. You would likely be very surprised to find that "civilized places" (international resort companies) either don't have or won't issue their guests such medicines. Bring your own. I use translucent film containers (have a few about) and only brands that are clearly stamped… along with inserts, to carry mine. Vitamins: Am a strong believer (have seen, lived the results) of supplementing my nutrition with these supplements. Particularly if you drink alcohol, don't know that you might be ingesting foods of sufficient nutritive value, do bring, take daily multiple vitamins. Neosporin, Band-aids, Q-Tips ™: Self-explanatory. I put all these in their own zip bag. Eye Shade and Inflatable Pillow. Can be friendship, nerve-savers when trying to sleep on planes, sharing rooms. Sewing Kit. A small travel one has saved me real trouble and misery over the years… some needles (for stitching tears in clothes, buttons, you if necessary), assortment of threads, a few misc. buttons. Clothing: A common "problem area" with most people, over- and mis-packing. All the places in the world I've been to that have inhabitants have clothing for sale… that is of use per the local conditions… Check guidebooks, the Net, and "when in doubt, leave it out". If you find you need, like something the "natives" are wearing, buy it there. Pants, Shorts: One long pants and belt, sometimes two. Cotton… for comfort, ease of drying. Many places, occasions call for modesty, pants in public. And at least one pair of shorts, with large pockets. Waterproof Windbreaker: I believe in layers rather than one piece functional clothing items. I pack this lightweight item in my carry-on backpack as it can get quite cold at elevation. Swim/Dive Trunks: Two generally. Types that dry out quickly… I wash, dry the other in the room while using t'other. I like "jogging" types which allow leg movement, that have a simple lining inside, no pockets except for a room key (which I generally leave with the front desk). Shoes: Almost always just one pair of tennis (two if "hashing", running in the mud, off-road), and sandals/zorries. Socks: Usually just two, three pair. 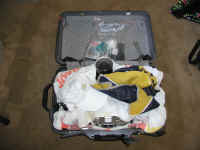 I wear a set as "booties" with my dive fins, and am either washing/drying a set, while using the other for land use. Hats & Shades: Think metal halide lights are bright? It can be even brighter in the tropics. Don't forget to pack a comfortable hat (one that covers your neck if you've got it), and sunglasses for beach and boat trips. Presents/Gifts: You like to get them? So do I and everyone else I've ever met. Ask the folks you're going to visit (yes, even hosts of hotels) what is scarce in their countries. Simple gifts of magazines, books, alcohol that are otherwise not available (if allowed), make-up… mean a great deal to people who cannot otherwise get them. Writing Gear: Simple or not… to use your time well… writing letters, drafts, poems, perhaps doodling with a new friend. Legal pads, pencils, pens. To make outlines, jot down ideas while out and about. Some folks even scribe final drafts this way. Reading Materials: Books for enjoyment, review. What better time to use? Don't forget your reading glasses! If you need/use them. Laptop Computer (often, not always). To write, Download/organize/manipulate images while in the field. Adaptor, A/C Connector/Charger, DVD/Stereo Gear, headset/s, splitter for two. Even if you're not "in the business" of making images, you are a "visually oriented species"… do take up the sport, habit of trying to make, share photographs, video… a tremendous pleasure and great source of enjoyment for all. Lenses: Even for the digital camera rigs there are add-on lens/adaptors. I carry my analog (Nikon) lenses in their fabulous screw together plastic housings to prevent damage. I routinely carry the following focal lengths 105, 60, 24, 20 mm., 70-180 tele-macro, as well as a 28-85mm and sometimes longer focal length lenses for above water work. I also use close-up extensions, diopters, 2, 3, 4X converter attachments. Specialty land wild-life (especially very long focal length) lenses... I generally borrow or rent these. Bag and Towel: Do get in the habit, for land and water use of transporting your camera gear about in a designated bag/backpack… and its (not yours) use towel… the towel and back will help keep off the sun, rain, salt-spray… and keep the inside of the camera dry (hopefully) should it pour, or you need to open the camera (as in to change film) while on an open boat. 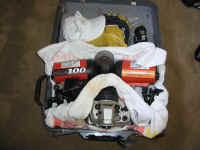 Batteries & Tools: How important a topic. Do consider switching over to rechargeable technology, even if only a casual user. Not only will this save you a bundle of money and headaches, the planet can use the boost in reusables here. Do read over the internet on what your choices in battery technology may be. My tool bag is a all-in-one small fold out unit and a few Allen keys, Jeweler's screwdrivers, manuals (I learn something useful every time I go over them), cleaning supplies (Q-tips, wipes, silicon lube of two types… use manufacturer's). Adaptors/Connectors: Are you going to want to download, show your photo-efforts on the road? Make sure you not only pack the cords, power units to do this, but do yourself the favor of hooking all of this up and trying, making sure its all there before doing so. Housing/s. Cleaned, O-rings removed, races cleaned ("Q-tips"), re-silicon lubed. Sync Cords: Per above, clean fittings, re-lube, test fire, cap threads, o-rings. Batteries et related gear.. If other sizes… more of the same gear as above. Spares: Being one of the worst all time examples of not bringing spare, back-up gear I've at least worked my way to using compatible, interchangeable elements. All my strobes and sync cords are TTL Ikelite, cameras, lenses et al. related gear Nikon, batteries NiMH rechargeables of the same brand… Do bring enough parts, spare gear to "do the job" or develop a "lazy Bob" scheme as I have done. The inventor of these should at least get the Nobel Prize. Look for the more sturdy varieties in a multiple of sizes… Incredibly useful for storing, keeping separate used/non-used film, dirty/filthy clothing, possibly leaking, messy materials like soap, shampoo… I carry an extra two of four sizes (up to 2 gallon) on every trip. Dive Gear: Some folks "just rent"… I don't. I like the comfort of using my own tried and trusted gear. I know how well-serviced, clean it is. If you think you might take up snorkeling, do it a few times a year, get, carry your own gear. Snorkeling: Many if not most of my most worthwhile photographs (almost all covers) are shot while "just snorkeling"… I "just" snorkel on every trip in addition to scuba. Much to see, better lighting, organisms that are much more "used" to divers. Mask: I usually take two, in plastic cases, with an extra strap. Fins: I typically use "Duck Feet" for both scuba and snorkeling. I like the feel, and precision movement they allow for photographic work. If space allows, currents demand I will take a set of jet type fins as well. Split fins are not useful for me. Snorkel: Even though some dive certification outfits actually eschew the use, training with snorkels for scuba, you'll want one for snorkeling, and I take a flexible one in my BC at all times. "One never knows..."
Scuba: Again, some folks always rent. I don't. BCD: Buoyancy compensating device. One size does not fit all… by a long shot. Regulator: I carry an extra second stage with me for businesses that require you have one, and a plug for the port if otherwise. I like this arrangement over the BCD fill/dump AND second stage alternatives, and keep the spare second stage dialed very low flow. Dive Computer: I carry, use two. One on my wrist and the other on my console, and believe the more conservative. Duct Tape: Laugh if you will, I wrap a few feet of this sturdy tool about a pen and take it with me every time. Great for field repairs, bandaging, emergencies of all sorts. 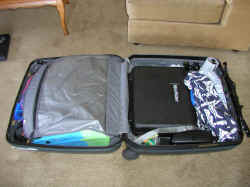 Practice getting organized: I like to lay out what is going on the trip, in/near the luggage/carrier I'm taking. (see image)… If possible for a few days unpacked, so I can look at, contemplate, add to the piles (sigh). Practice packing: One could write about this topic philosophically for ages… you want stuff not to get disheveled, well, to the point of not getting broken. I pack towels, use intended containers to move expensive gear… Pack dive computers in BC pockets… underwater light rigs in their own cases… Within reason, a co-desire to preventing things staying intact is squeezing them all into the smallest space possible. It's not lost on me that the universe was at one time the size of something like a volleyball… Practice. Security: I like to keep all the "paperwork" listed above, wallets, photo gear, computer out of sight and locked in my combination lock luggage. This has served me well for many years… Actual losses I've suffered include hotel safety boxes, airport luggage handlers, foreign governments… but nothing from my simple locked luggage in my room. About Luggage: I side very heavily on function versus esthetics here. Good, sturdy, carrying bags is my credo; not pretty, touchy types. Solid cases: I use Samsonite because it is reasonably priced, tough, common (you don't want your valuables to look like they're packed as such), durable, and their customer service/repair business is exemplary. I don't use soft-bodied luggage for damage and waterproof reasons (some places/times the luggage has to be literally thrown overboard and carried/floated in to shore…). 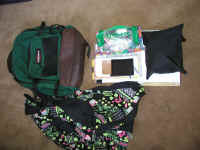 Backpacks: I swear by my Eastpak http://www.eastpak.com/. After looking at hundreds of different makes, models, I can assure you these people know what they're doing… great designs, construction, features. Check them out. About "Going Through Airport Security": A "hassle" for some… a necessary expedient for me. Help make the folks jobs easier… with clear packing backs, translucent film containers for parts, pills, a clear, easily-redone packing plan. I actually enjoy showing folks my "packing art" and how quickly I can re-pack all. Check In: All diving, on-site clothing, underwater dive gear. I do hand carry my camera bodies, lenses, underwater housings… but leave them under the seat, packed over head. About Photographic Film: There never was such a non-invasive technique of "Film Safe" x-ray bag checking. Even "just some" irradiation is "to a degree" damaging to all photographic film, irregardless of ISO. I have our employees at the airport hand check my film which I carry in plastic film containers, bagged in zip bags, in lead lined film bags otherwise. By now you might be thinking, "Bob the Fishman is out of his mind for making lists, let alone carrying about all this stuff. I just take a toothbrush, credit card and I'm good to go". Trust me. Develop your own checklists, or adopt/adapt the ones here. Consistency maybe "the hobgoblin of little minds", but more than hobgoblins will "get you" should you forget something important on your adventure travels. Fenner, Bob.1995. Take up Scuba Diving. FAMA 7/95. Fenner, Bob. 2001. Collecting Marine Organisms with an Emphasis on Diving. 4/01. Fenner, Bob. 2001.Underwater Photography. FAMA 4/01.